When I close my eyes, the smell of spring snow, the cool breeze teasing my face, all of it fills my senses. 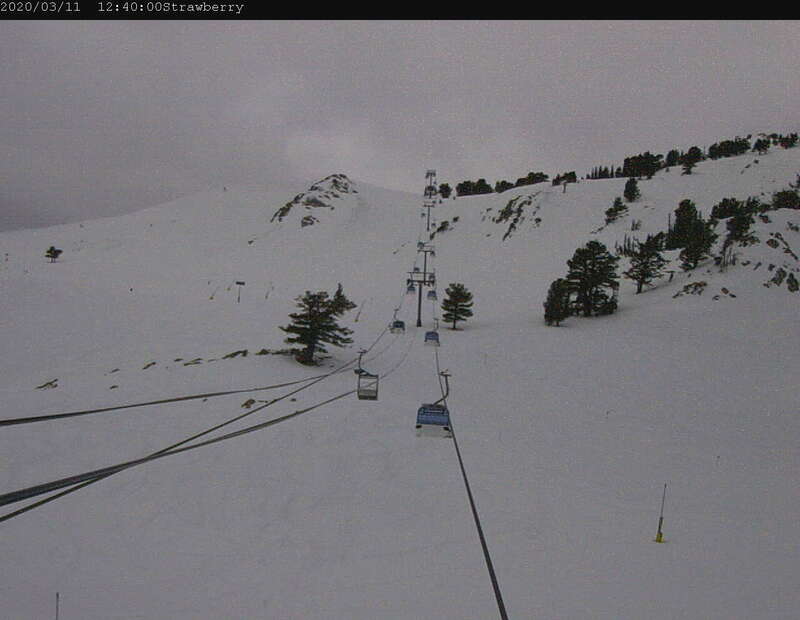 My parents taught me to ski as a young child, taking the time to bend over and buckle my boots with frozen fingertips. Then teaching me to snap into these sticks we call skis and slide down mountains. They gave me skills and dreams and in short, they taught me to fly. Of all the moments spent on snow, my favorite childhood memories are of exploring both my home mountain and new ones. Diving into the trees, emerging in hidden meadows, imagining that this mountain was all my own to discover. So naturally as a parent to 3 young kids, teaching them to ski was goal number one. Giving them space to explore is the second. 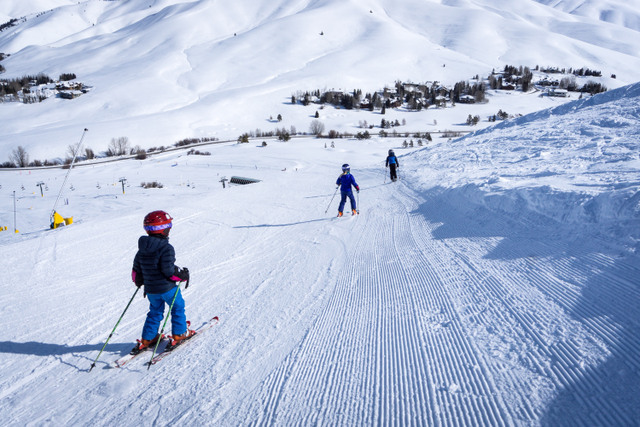 The Snowbasin Premier Pass gives our family unprecedented ability to explore both local and distant world-class ski resorts, for FREE. In case you don’t know of the benefits of a premier pass, they are listed at the end of this article. However, one of the most amazing perks is 5 free days of riding at Snowbasin’s sister resort - Sun Valley, ID and this season we took full advantage of it! 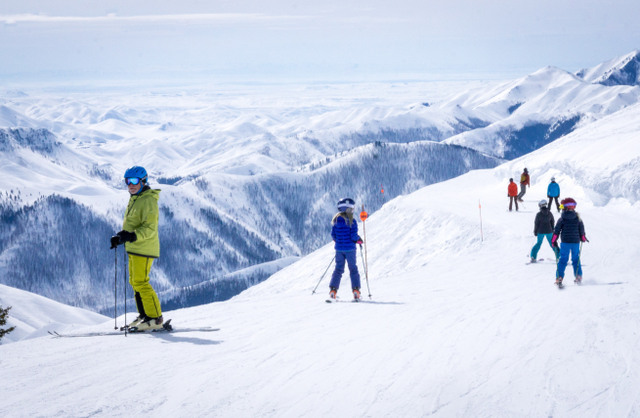 Sun Valley, ID is located roughly 3 hours from Boise, ID, an hour north of Twin Falls and less than 5 hours from Salt Lake City, UT. 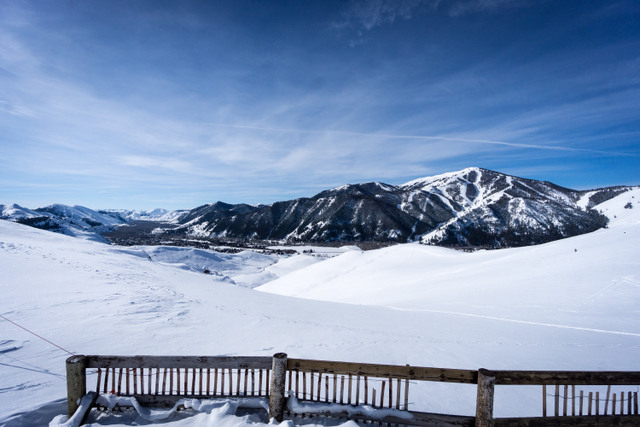 People say "Sun Valley" in reference to the ski resort but really it refers to the amazingly cute town of Ketchum, ID and two resorts: Bald Mountain (the big mountain, a.k.a. Baldy) and the historic Dollar Mountain. 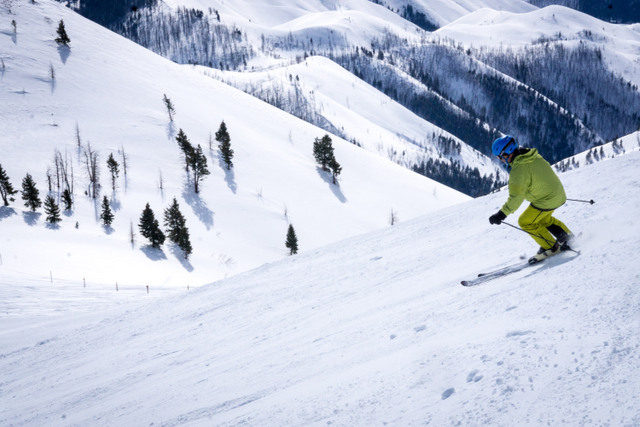 Ketchum, ID sits on the lap of Bald Mountain, making it the perfect home base for exploring, dining, shopping and off-slope entertainment. We arrived mid-week and after following a tip to grab our passes from the base at Bald Mountain, we jet over to grab our passes from the ticket booth at the Warm Springs Day Lodge. Our Snowbasin Premier Passes needed to be shown at the ticket window and they issued us day passes for any duration we desired up to 5 days. If you get your day passes at Bald Mountain, they are also good at Dollar Mountain. Once you've received your day passes, you are good to go for the duration of your trip! 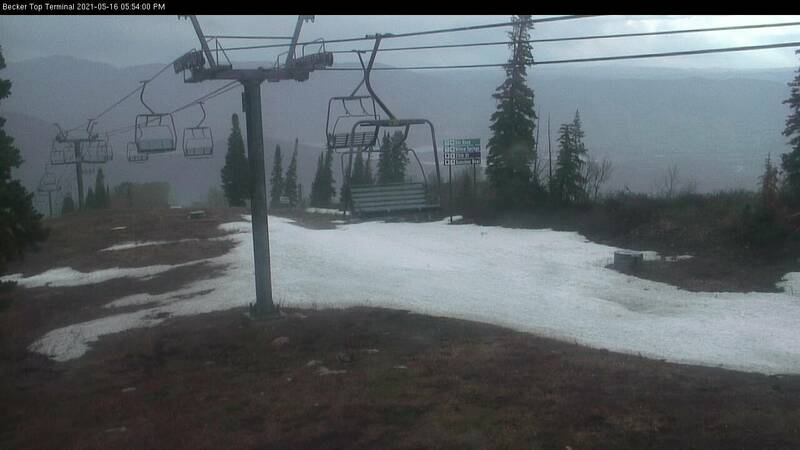 On day 1, we decided to visit Dollar Mountain, excited for our kids to lead the way on this smaller, local ski hill. 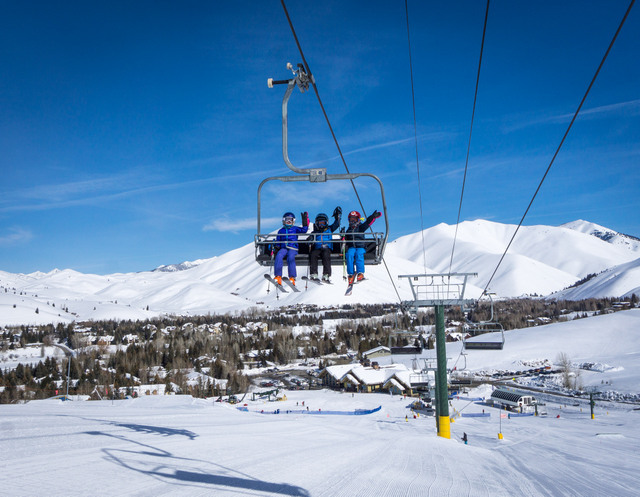 Dollar Mountain is the original ski area in the Sun Valley area, the first destination ski resort in North America and first opened for business in 1936. 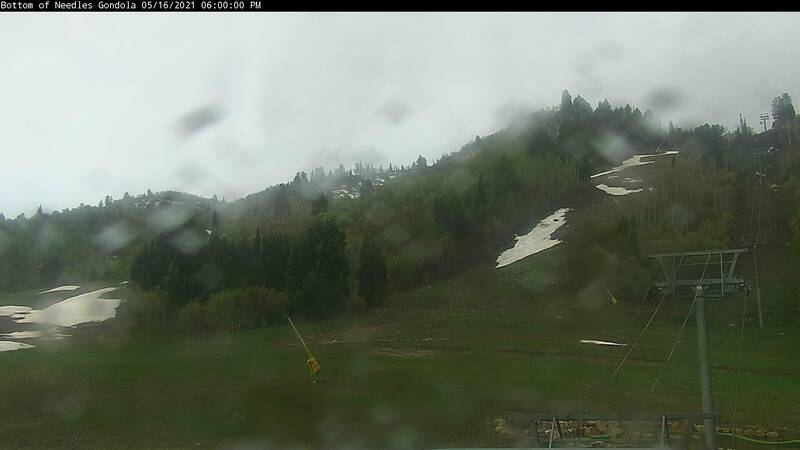 The newly updated lodge closely resembles their sister lodges at both Sun Valley and Snowbasin. Dollar Mountain is served by four chairlifts: Dollar, Half Dollar, Quarter Dollar, and Elkhorn. A unique mountain in that it is entirely treeless, Dollar Mountain consists of trails that are gentler in pitch and shorter than those on Baldy. 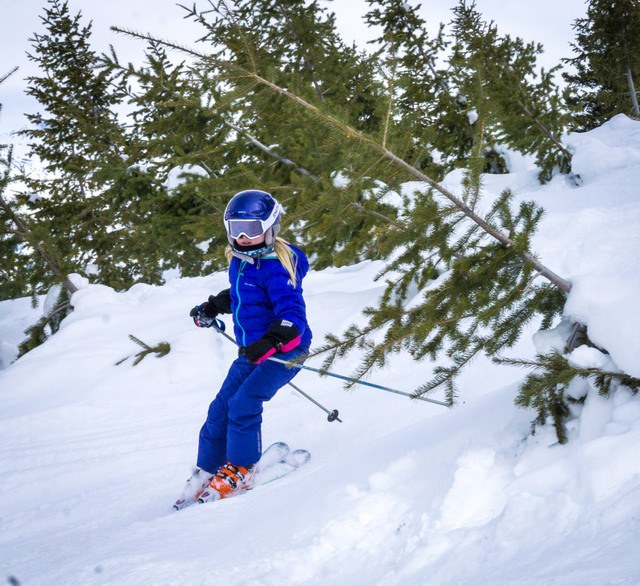 We felt comfortable allowing our kids to go off and explore the mountain on their own. 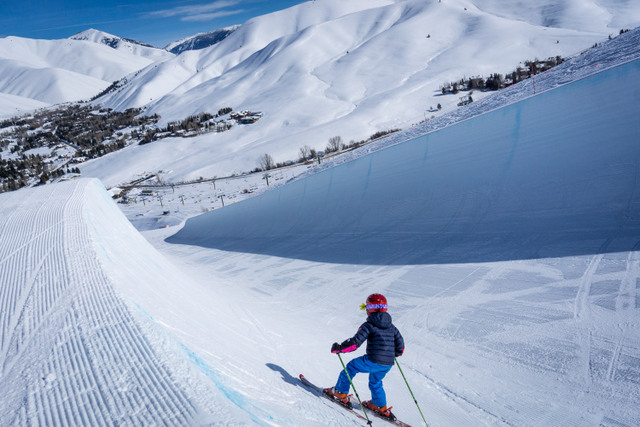 We’d look out on the hill while riding the Dollar lift to see three little rippers cruising down a ridge or heading for the Super Pipe. Multiple terrain parks of varying difficulty also make Dollar Mountain a highlight of our time in Idaho for sure! 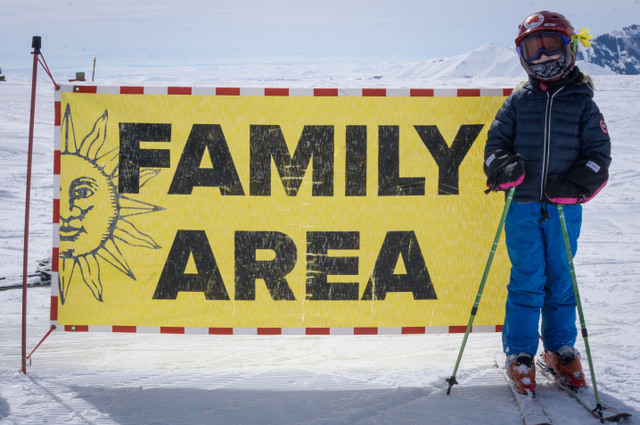 On days 2 and 3 we took our family of rippers up to Baldy. In our minds we were going to explore this mountain and get to know it. In reality we barely scratched the surface! Bald Mountain has 2054 skiable acres, wide open bowls, endless steep groomers, glades, adventure parks, and views that stretch forever. There are two base areas accessing Bald Mountain. 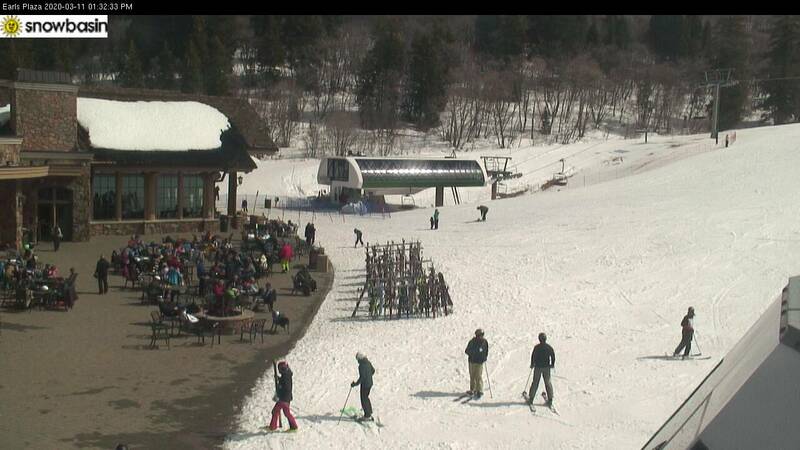 River Run Plaza, the larger of the base areas, is very similar to Snow Basin in appearance and it is the location of Sun Valley’s only gondola. Warm Springs is the smaller, more “local,” base area and the one we decided to park at. 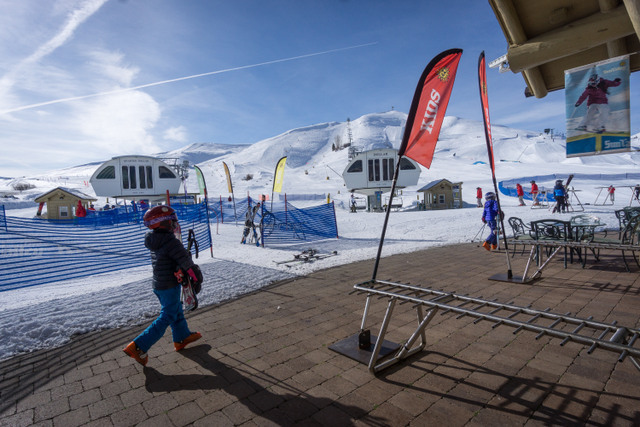 With parking a “stone’s throw” from the lifts, no crowds, and free shoe/gear cubbies in Warm Springs Day Lodge it was a good decision! 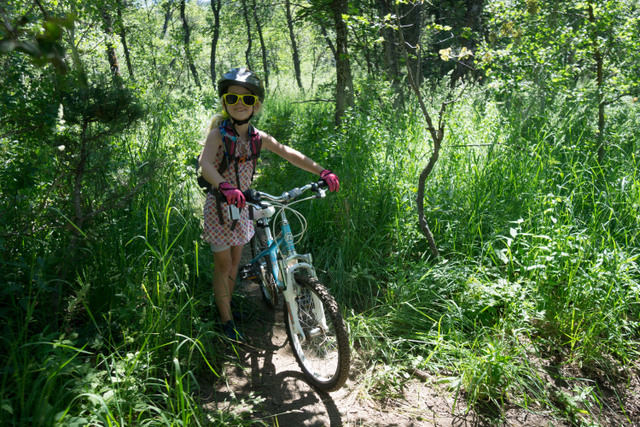 At both Dollar Mountain and Baldy, there are a series of family adventure parks and trails. 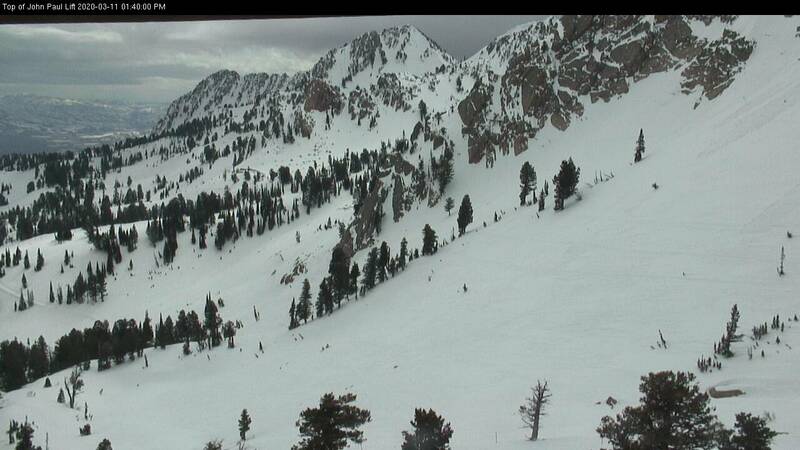 Some are more obvious, like the skier cross course over at Seattle Ridge. But many are hidden gems, scattered all over the mountain and waiting for your kids to discover them. Locate them on the trail maps and make them a part of your ski day! NEW! 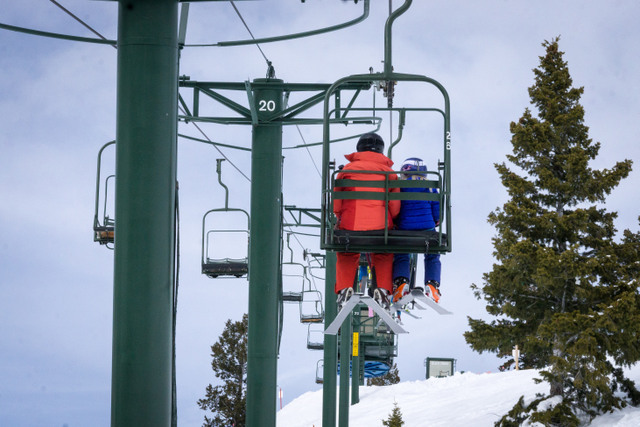 50% off unlimited day tickets at 15 Mountain Collective destinations - Alta, Aspen Snowmass, Jackson Hole, Mammoth Mountain, Snowbird, Sugarbush, Sun Valley, Squaw Valley/Alpine Meadows, Taos, Telluride, and 5 international destinations. Discounts on room rates at the Little America, Grand America Hotel & Sun Valley Inn (on a space available basis).